Ballymena United under 12’s were unlucky to lose out in a thrilling cup tie against Greenisland at the weekend. It was heartache also for the National under 13’s as they exited the NIBFA cup at the quarter final stage against Limavady. The Academy’s second string at this age group lost out narrowly to a determined North End side in the weekends town ‘derby’. BUYA 4, Limavady Colts 2: An excellent United performance, particularly in the first half, was capped by a hat-trick from Adam Millar. BUYA 4, Greenisland 6: Despite being weakened by a number of call-ups to the under-13s, United went two up through Scott McCullough and a Blake Douglas penalty. Greenisland pulled a goal back but Robbie Gilchrist and Kyle Neill made it 4-1. 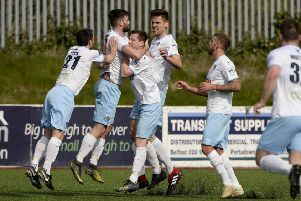 The skies lost left back Douglas through illness and Greenisland pushed on with two goals as they seized on a weakened United defence, two late goals eventually deciding matters against a tiring United side. BUYA 1, Limavady Youth 2: In this NIBFA CUp quarter-final tie, Limavady took a first half lead, only for Sean McAllister to equalise with a terrific shot from the edge of the box.Both sides searched for a winner and Limavady got it when they scored direct from a corner. BUYA XI 3, Northend 5: United’s second side put in another stirring performance in the town derby but were beaten by determined opponents. Goals on the day came from Jude Currie,Jamie Neeson and Jason Magee. BUYA 0, Glentoran 4: The Glens came out second half all guns blazing and Fry was forced to make a brilliant early save, however from the resulting corner, the Glens scored. Three second half goals inside a six minute period early in the second half meant that the SKy Blues were left chasing a lost cause after a superb first half performance. By now the game was dead, although to their credit the majority of the team put in a full blooded effort and kept going till the end, but their heads were down. Ballymena United U-17 2, Loughgall U-17 0.